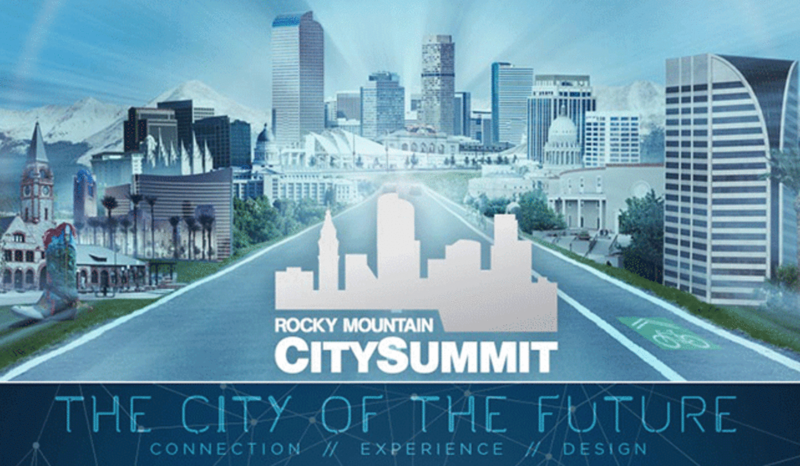 Just about two months ago Rocky Mountain region civic leaders, planners, developers, and distinguished out-of-town guests convened for the sixth annual City Summit. 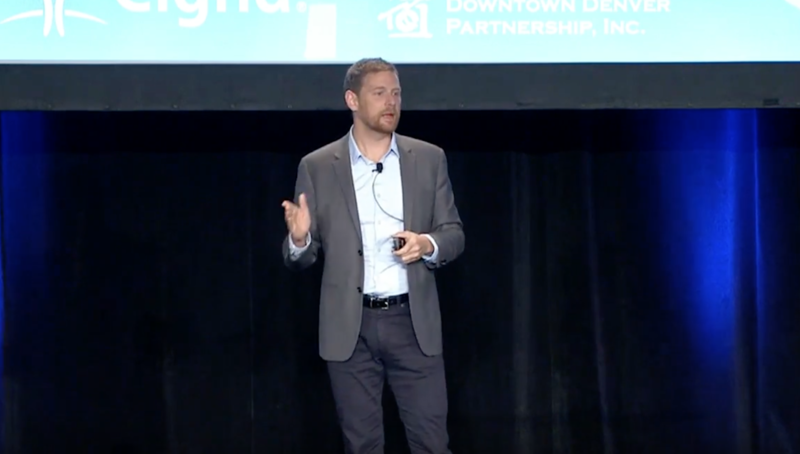 Held in Denver and hosted by the Downtown Denver Partnership, this one-day event is packed with keynote speakers and breakout sessions. 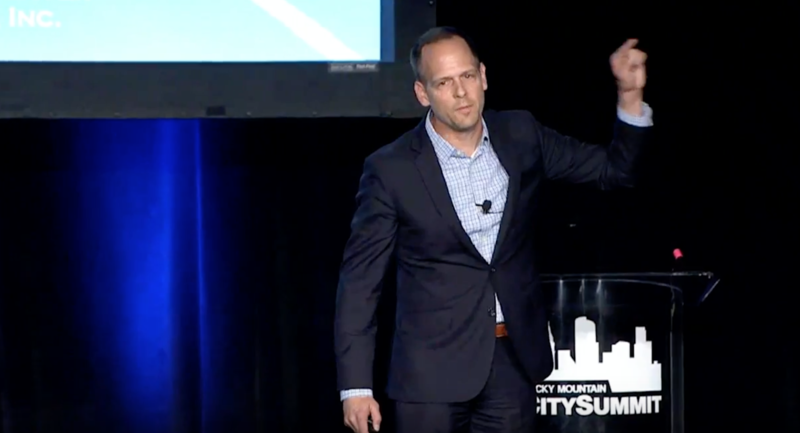 This year’s Summit theme was “The City of the Future.” This post describes what happened and suggests some takeaway lessons. A Murderers’ Row of influential urbanists offered morning keynote speeches. Charles Montgomery led off by speaking about The Happy City, drawing on his book of the same name. He plugged urban design’s role in boosting happiness, which he associates with feelings of social connectedness and trust. Montgomery sounded some familiar notes. We need to stop subsidizing sprawl. We need to start maximizing sociability and “equality of quality of life.” We can accomplish this by replacing blank-walled street frontages with active, fine-grained edges. We need “jumbled, busy, gritty and more connected” public spaces, ideally ones that are infused with local color and culture. Montgomery complimented Belmar, the Denver metro area’s textbook example of good New Urbanist infill (for a different view, see here). Mass transit can also make people happy, especially if stations are embedded in interesting walkable environments. Denver’s Light Rail system has a way to go in this regard. So too our city’s bikeways. Montgomery advised us to avoid the kinds of bike lanes pictured on the City Summit brochure (below), because no more than 7% of people are inclined to use them. In short, Montgomery empirically demonstrated how “place attachment” not only creates personal happiness but also more compassionate and community-engaged citizens. 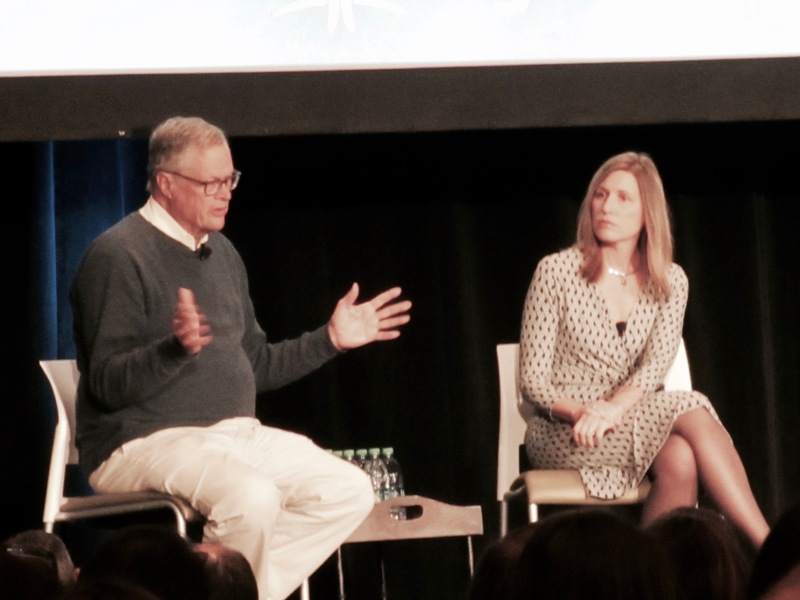 Jennifer Vey of The Brookings Institution and Fred Kent of the Project for Public Spaces (PPS) were up next. They tag-teamed a presentation on “Placemaking and Innovation.’ Vey considered some of the trends driving urbanization today, focusing on the positive impacts of proximity and density. She invoked Edward Glaeser’s definition of the city as ‘the absence of physical space between people.’ This line clearly resonated with Summit tweeters. Vey asserted that a mix of people—new immigrants among them—is key to urban vibrancy and innovation. The Brookings Institution has aggressively championed a “New Urban Paradigm” that seeks to achieve a better nexus of innovation and place. “Innovation Districts” bring networking assets together in one destination, fostering forms of human interaction and collaboration that fuel the innovation economy. Channeling Montgomery, Vey argued that such urban hubs also offer opportunities to realize human happiness. Batting clean-up was Christopher Beynon, director of Planning and Design Services at the Berkeley-based design firm MIG. He spoke about “Creating the Inclusive City.” After celebrating the “urban renaissance” in Denver (e.g., Union Station) and elsewhere, Beynon addressed the costs of the new urban prosperity. Among them is the $3,800 monthly price tag for a one bedroom rental apartment in downtown San Francisco, and the $16 price tag on a large, siphon-brewed, premium blend at the local coffeehouse. And then there’s displacement, loss of community, and the increasing whiteness of downtowns just about everywhere urban revitalization is happening. Adopting an explicitly ecological viewpoint, Beynon passionately argued that everyone is impacted by these undesirable social and economic conditions. As a guide for bringing things back into balance, Beynon detailed five elements of the Inclusive City. First, the Inclusive City is prosperous. It fosters 21st century job growth across all wage levels. Second, the Inclusive City is educated. It offers a spectrum of learning opportunities (experiential, vocational) beginning with Pre-K, and provides flexible day care for low and middle wage workers so that educational opportunities can be realized. Third, the Inclusive City is diverse. Its mosaic of neighborhoods offers housing of all types and at all price points. Fourth, the Inclusive City is connected. TOD networks are fully built out so that mobility options are maximized for all neighborhoods. Finally, the Inclusive City is healthy. Its green spaces are widely accessible and it offers equitable access to good food. Beynon wrapped all of this together by noting that humans are the meaning-making animal. Cities must be places that allow people from different cultural backgrounds to make meaning for themselves, to “own” the city in different ways, and to determine their own futures. Just about every audience Q&A following these talks zeroed in on what Beynon foregrounded as the price of our urban prosperity: gentrification. How can we make it so that the long-term residents of revitalizing neighborhoods aren’t displaced, and that the city center is as demographically diverse as the nation at large? Not everyone had a satisfactory answer. Beynon was asked to name cities that are doing inclusion especially well, and he was at a bit of a loss. He suggested that no city is doing great because the focus up to now has simply been on attracting people back to the urban core. Jennifer Vey came closest to hitting the mark: we need to start locating innovation hubs in low income communities. The benefits of gentrification don’t trickle down, something that even the original author of creative class theory has come to realize. Alternatively, the approach must be intentional and aggressive, with local residents intimately involved in decision-making. The Summit’s break-out sessions provided additional opportunities to explore answers to questions about inclusivity and equity. The answers will likely be familiar to readers of this blog. Community Land Trusts, micro-housing initiatives, and affordable housing funds all got some run (the affordable housing fund recently established in Denver received plaudits). Christopher Beynon opined that, in the Inclusive City, affordable housing shouldn’t be distinguishable from market-rate housing. That is, it doesn’t need to look generic, cheap, and impermanent. However, there’s also no reason why affordable housing shouldn’t look better than market-rate housing. We have some iconic, meaning-rich examples right here in the United States, like the New Carver Apartments in Los Angeles. Transforming traditional community institutions can also help create equity. For example, leaders from the Denver Public Library and the Free Library of Philadelphia offered some compelling ideas for turning these stuffiest of American institutions into business incubators, job training sites, and other kinds of community resource centers. 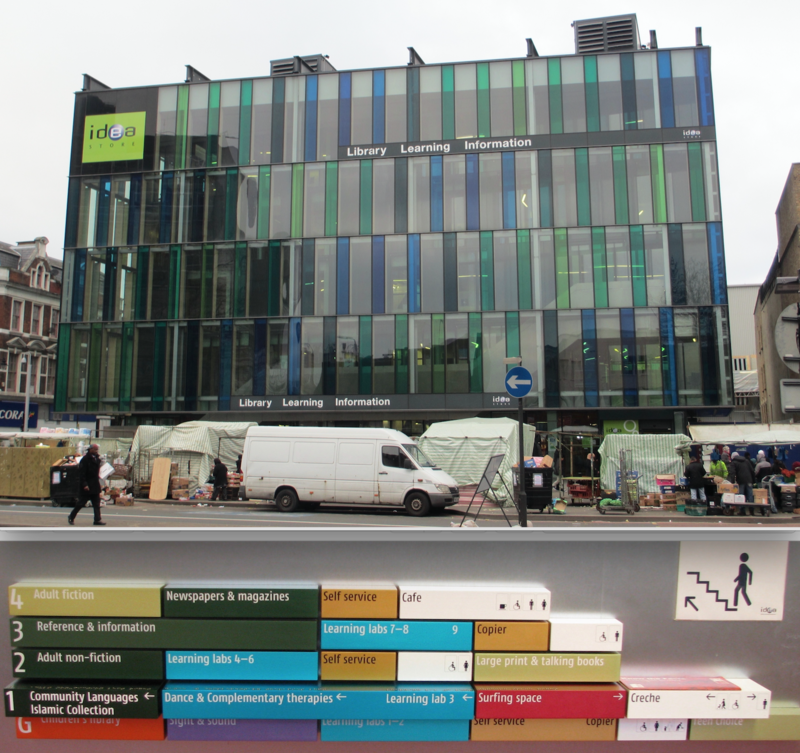 The vision is reminiscent of what made London’s Idea Stores cherished community assets. There was strong consensus that we need better public spaces and better programming of those spaces. We could use more liberal zoning rules so that displaced people have opportunities for settling in other parts of the city that are currently off limits. Public-Private Partnerships were strongly endorsed as a way to foot the bill for various experiments in placemaking. Finally, and perhaps most importantly, multiple speakers urged professional planners and urbanists to get out of their silos and begin thinking and collaborating across disciplines and agencies. The critical perspective on contemporary urbanism offered at this year’s Summit was refreshing given the overly triumphal tone of last year’s Summit. There were numerous good takeaway messages. The calls to remove silos between thought and practice, and deconstruct language differences across disciplines and agencies, were well-taken. Focusing on the users of space—i.e., people, and their spectrum of needs ranging from the economic to the spiritual—is to the good. So too is calling out the limits of design to achieve social goals. But we shouldn’t discount design too much. 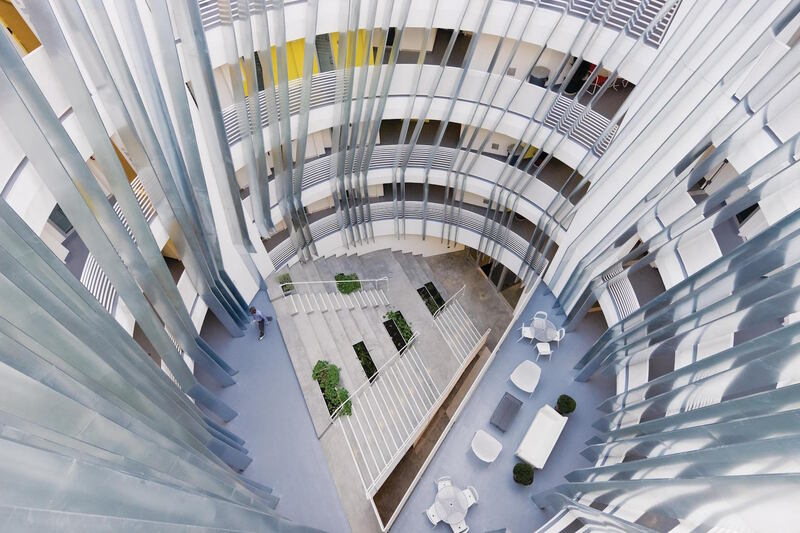 There still seems to be a dearth of good work about how architecture and public space can be designed to accommodate cultural differences, and thereby facilitate the sort of meaning-making discussed by Christopher Beynon. The consistent invocation of culture at this year’s Summit was music to an anthropologist’s ears. It was good to hear from keynoter speakers and breakout session leaders alike that culture drives cities, that place must be infused with culture and cultural meaning, and that change should connect to the culture of a community. Of course, anthropologists don’t have a monopoly on understanding culture as it relates to human buildings and landscapes. However, our perspective is unique in that it is unbounded by time and space. Thus, inserting anthropological and archaeological knowledge about cultural diversity and meaning into planning curricula, and staffing planning offices with professional ethnographers skilled in working with communities, would seem well-advised if the vision of an inclusive, equitable city is to become a reality.